NEW LOW PRICE!! 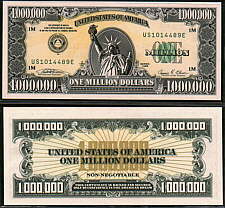 When this Million Dollar Bill is viewed under a blacklight, the words "A Symbol of the American Dream" appear VERY BRIGHT over and over across the whole back of this bill. This bill also comes with an Information Sheet. GREAT BUY ON A QUALITY BILL!! 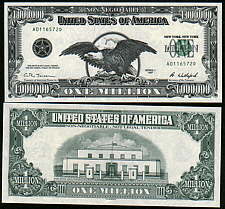 This bill comes with a Certificate of Authenticity and an Information Sheet.